Product Detail: Rise Up Singing! Since the time before the Civil War and in the 150 years since, the African American culture has made many lasting contributions to life in this country and all over the world. That's why we have assembled these eight great arrangements that give you strong programming across the genre of African American music. From spirituals to anthems to the roots of jazz, you will find songs that inspire and uplift all year round. While many of these settings are fairly straightforward and unison, and all are orchestrated appropriate to the tune, there are several outstanding 3-part mixed arrangements that have already become concert favorites. These include such classic works as "Go Down Moses" and "Yonder Come Day." Down By The Riverside - For this arrangement, we have used an up-tempo gospel setting a bit modernized with the addition of our screaming wind section, blues guitar, and a gospel organ. It is arranged in a traditional 3-part mixed voicing, and allows the third part to be sung by boys whether they have changed voices, changing voices, or low unchanged voices. Follow The Drinking Gourd - This "code song" is probably one of the most dramatic to have survived until today and is an excellent song for a unit on the Underground Railroad. Our version is arranged in a singable folk style. Get On Board - In recent years this has become a popular children's song, always fun to sing because of the rhythmic vitality of the chorus. For this arrangement, we have done our own adaptation of the lyrics to make them appropriate for any school. We have amplified the train aspect of the song with the percussion and with the train whistle imitation in the winds and vocal parts. Yonder Come Day - This great spiritual from the Georgia Sea Islands gives you both a new perspective on music for African American History Month and a 3-part arrangement appropriate for your older students. It combines a traditional concert approach, opening with an evocative orchestral prelude, leading to building voices over hand claps. One More River - This wonderful old spiritual can be used as part of African American History Month or just because it is a favorite call and response tune. As with quite a few traditional tunes, there are many possible variations on lyrics and performance. In this arrangement, percussion sets up a traditional rhythm under the 6/8 rolling feel. Go Down Moses - This unique arrangement combines a concert approach to the tune as well as a gospel swing setting. It starts dramatically with full orchestra and winds down into a fairly traditional setting of the song. The vocal arrangement is set up so that it can be performed either as 3-part mixed or as a unison arrangement. 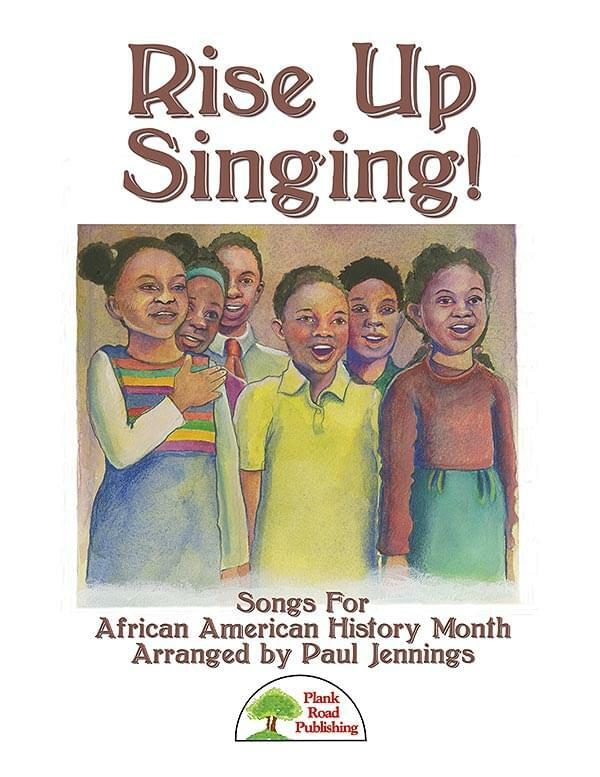 Lift Every Voice And Sing - This powerful song was written by James Weldon Johnson and his brother J. Rosamond Johnson for the celebration of Abraham Lincoln's birthday in 1900 and went on to become known as The Black National Anthem. This arrangement is set rather traditionally, and the orchestration is meant to sound as if it were a turn-of-the-century theater orchestra. This Little Light Of Mine - For this much-requested song, we chose the version we knew the best, and did it in a popular gospel style which is a joy to play or sing. We use four verses, the fourth verse being a "bring it home" version of the first verse with an extended ending. It's difficult not to move and clap during this song!